This recipe is based on a recipe for plum crumble by Marion Burros, a crumble I made 11 years ago for this site. So much has changed since then, but my love for the topping this crumble makes has not wavered. It’s a little like a good sugar cookie — crisp on top and soft in the center. Unlike a crisp, where the softness of flour and oats sort of melt into the fruit, this is a fruit dessert with a definite presence. It’s wonderful with Italian prune plums but I think it might be even better with pears. This is the fall we have all swooned over pears. My kids go through apples at a rapid pace. But for some reason, we’ve been finding perfect pears in our local grocery store. Pears are so particular — a few days too early and they are too taut, the skin stuck between the teeth, a few days too late and they turn to mush against the tongue. But just right and they are sweet as honey with flesh that softens as you eat it. Those are the pears you want for this crumble. You mix sugar, spices, a little flour, and evenly chopped pears. Spread them out in a 9×13 pan — you’re going to make a big crumble here, since everyone is going to want to eat some. And then you mix the dry ingredients and then plop in three eggs. When you work the eggs into the flour with your hands, it will turn crumbly. 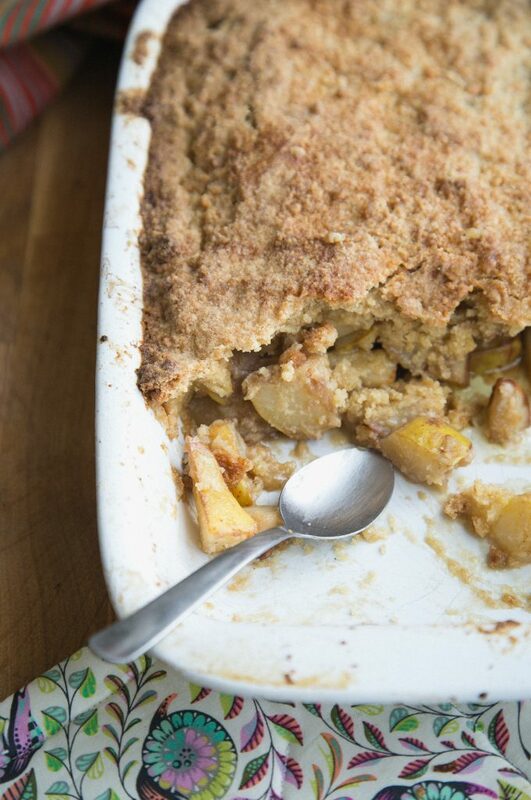 Here’s the part that makes this crumble special: put the flour over the pears and drizzle melted butter all over it. When it bakes, the topping will turn crunchy, like a cookie. Inside, soft honey-sweet pears. Prepare to bake. Heat the oven to 375°. Prepare the pears. In a large bowl, toss together the brown sugar, flour, cinnamon and ginger. Add the chopped pears and toss until they are coated. Put the pears into a 9 x 13 pan. Make the topping. Combine the sugar, flour, baking powder, ginger, and salt in a large bowl. Plop the three beaten eggs into the bowl. Using your hands or a rubber spatula, work the eggs into the flour mixture, making sure that all the dry ingredients have been touched by the eggs. This should be a crumbly mix with dry bits. Spread the topping over the pears. Slowly, drizzle the melted butter over the topping. It will look soaked. You might worry there is too much butter. Trust the recipe. This works. When 2/3 of the butter is drizzled into the topping, spoon the rest over any dry spots until all the butter is on the topping. Bake the crumble. Bake the crumble until the topping is browned and starting to crisp and the pears yield to a sharp knife when pierced, 30 to 40 minutes. Allow the crumble to cool for 15 minutes then dig in.